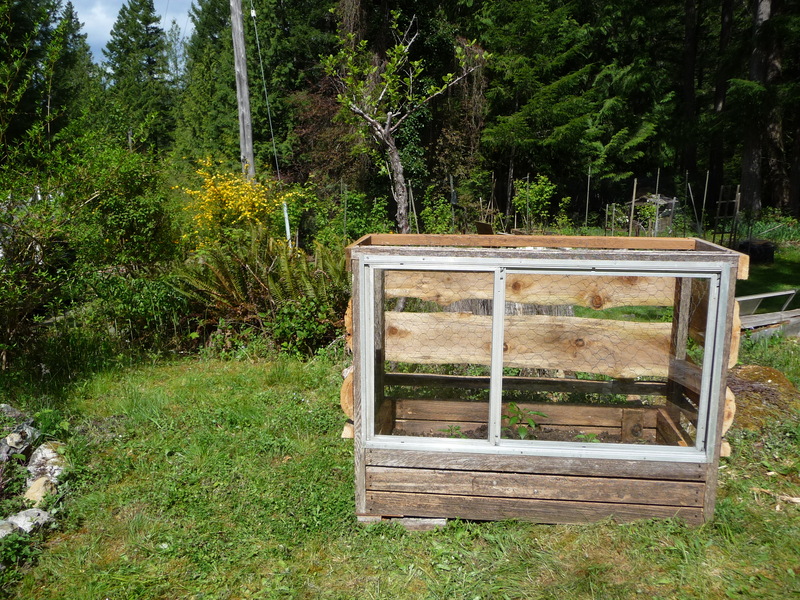 Here is the new box that John made from old decking and slabs of cedar from the tree that concealed the pumpkin seeds in “Thuja plicata: Nest Boxes”. The aluminum window comes from my parents’ home in Royal Oak and the box is lined with chicken wire against the predations of the two deer sisters that we see every week or so. 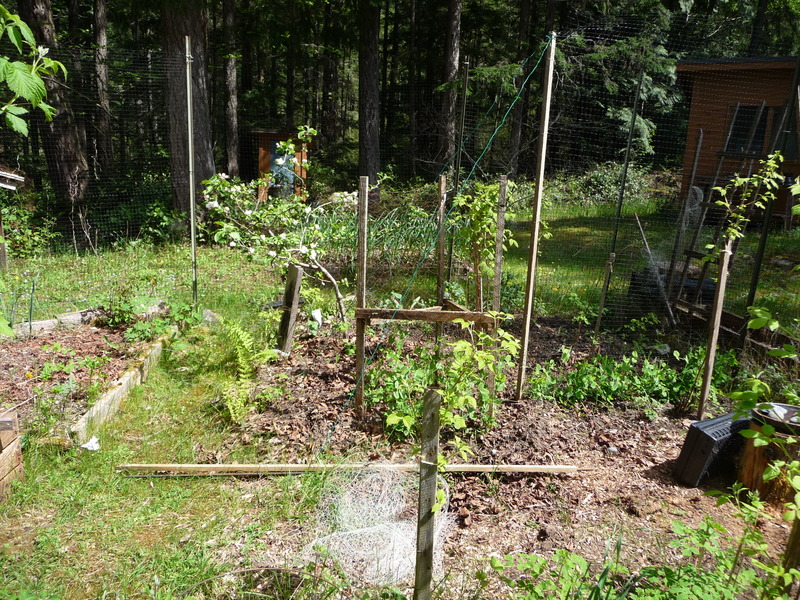 Right now there are peppers in the box and shortly I’ll put some cucumber seedlings against the back where they can clamber up the chicken wire. And as I write this, John is in the process of setting another of the boxes in place. 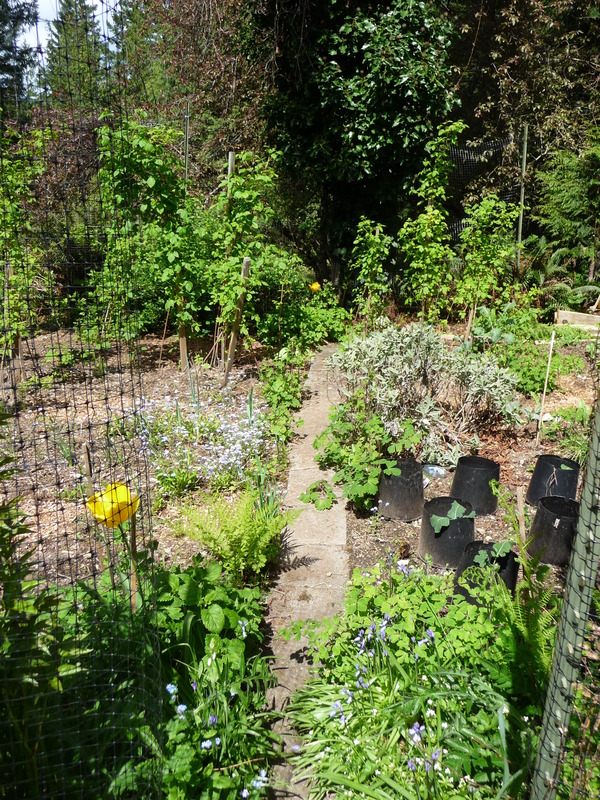 And here’s the path down the middle of the vegetable garden. 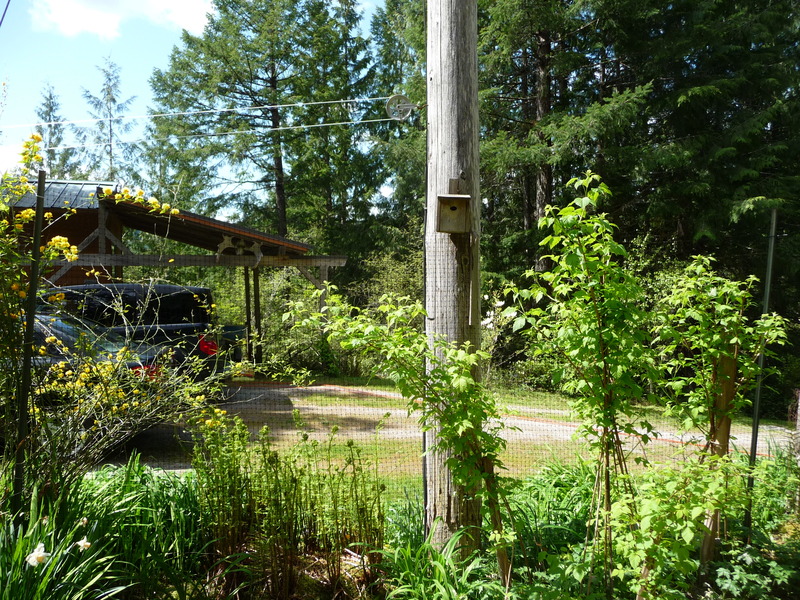 This is the box where a pair of chestnut-backed chickadees are nesting. We’ve watched them over the past few days plucking moss and dry grass for their nest and sometimes when I’m in the garden, I see one of them peering out the opening to see if it’s safe to fly out. 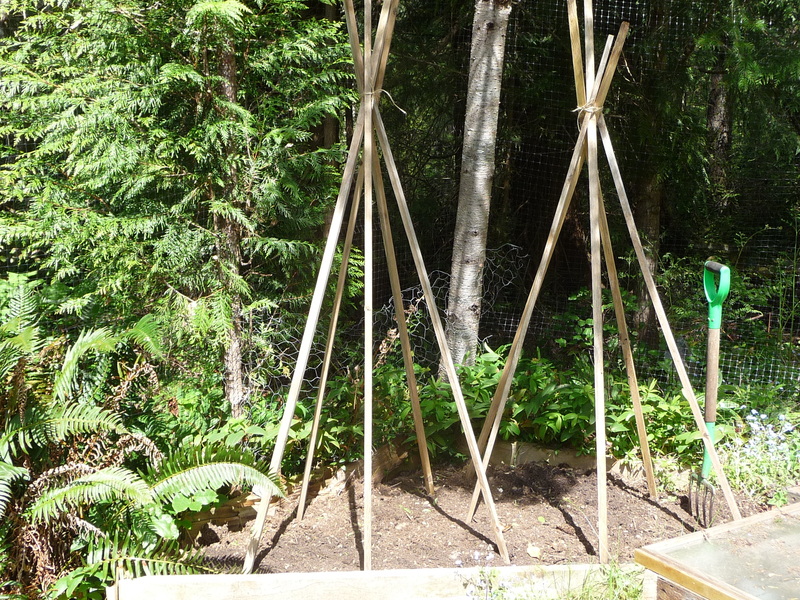 This morning I made two bean teepees for the pole beans which are hardening off on the upper deck. (I begin them in flats in the sunroom because otherwise birds pluck the newly sprouted seeds out of the ground and nip off the sweet stems.) I have edamame beans to plant out too but they’re bushier and will just have individual sticks to support them. This is a dwarf apple tree in lovely bloom and Mendel’s peas climbing up their wire. 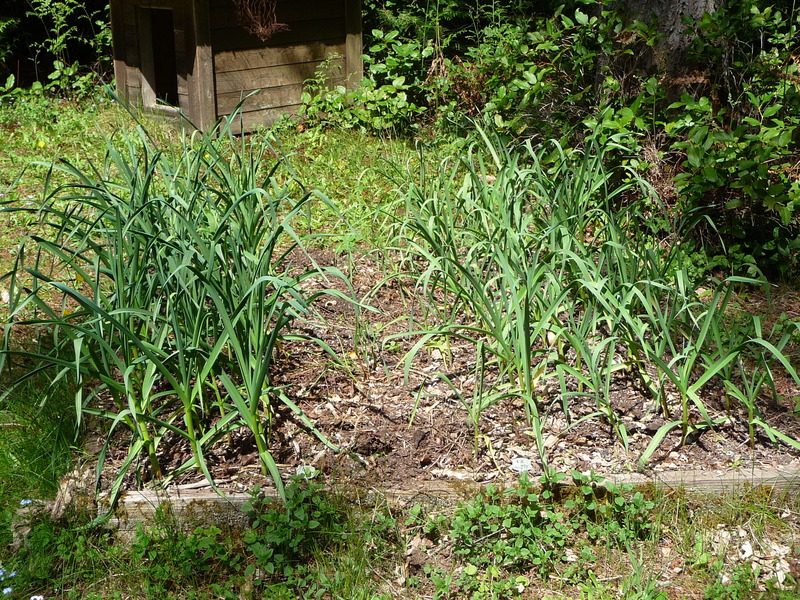 Two kinds of garlic — one from Galiano Island and Red Russian from Grand Forks. 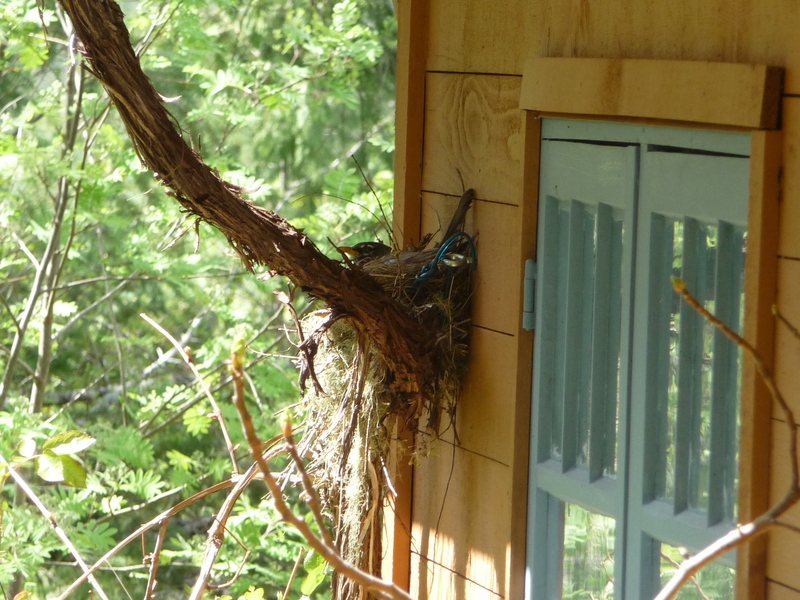 And here’s the female robin on her nest. The eggs haven’t hatched yet and she’s there pretty much all the time with the male bringing her food. 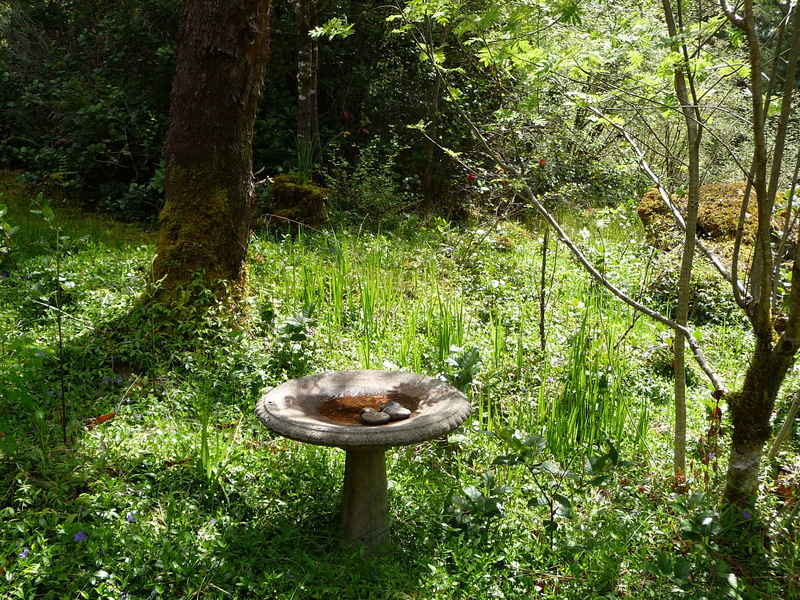 This is where they bathe — and just after I looked at the photograph on my computer, I ran out to put fresh water in the bird bath. ~ by theresakishkan on May 9, 2012. This entry was posted on May 9, 2012 at 10:59 pm and is filed under Uncategorized.You can follow any responses to this entry through the RSS 2.0 feed.You can leave a response, or trackback from your own site.